Willem I was the first King of the Kingdom of the Netherlands. Willem Frederik, Prince of Orange and Nassau, was born in The Hague on 24 August 1772. He was the eldest son of Prince Willem V and Princess Wilhelmina of Prussia. On 1 October 1791 he married his cousin Princess Wilhelmina of Prussia in Berlin. His second marriage, on 17 February 1841, was to Countess Henriëtte d&apos;Oultremont de Wégimont. In 1802 he became the ruler of the German principalities of Fulda and Corvey, which he had been given by Napoleon Bonaparte as compensation for the loss of his Dutch domains in 1795. He lost these new possessions in 1806, as punishment for his support of Prussia in a new war against Napoleon. He then withdrew to his lands in Silesia. When Napoleon fell, the Prince of Orange was in England. In November 1813, at the request of a number of leading Dutch citizens, he returned home, to an enthusiastic popular welcome. On 2 December 1813 he was proclaimed Sovereign Prince of the United Netherlands, comprising the present-day Netherlands and Belgium, and was invested as such on 30 March 1814 in the Nieuwe Kerk in Amsterdam. 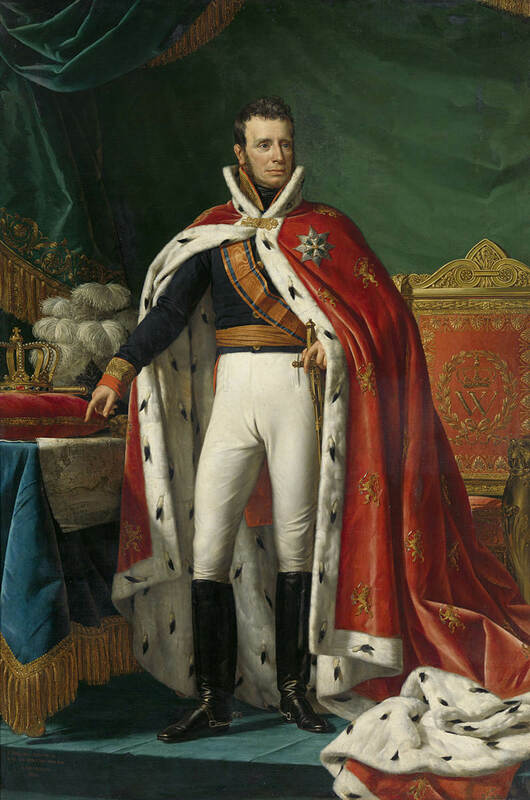 On 16 March 1815 he accepted the throne and was invested as King in Brussels on 21 September 1815. In the same year he also became Grand Duke of Luxembourg and in 1839, after the definitive secession of Belgium, Duke of Limburg. He abdicated on 7 October 1840, assuming the title of King Willem Frederik, Count of Nassau, and was succeeded by his son, Willem II. Willem I died on 12 December 1843 in the Dutch Palace in Berlin.